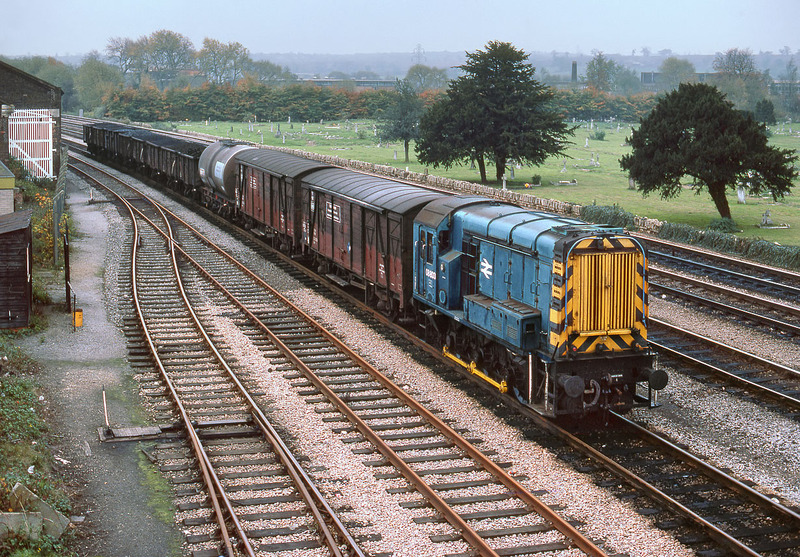 On 29 October 1982, long term resident Oxford shunter 08803 (scrapped in 1994) heads towards Oxford station along the bi-directional goods loop with a short rake of vacuum braked wagons, including a number containing domestic coal. The siding on the left, which as can be seen by the shiny rail, was still well used in 1982 leads into the scrapyard on the site of Beckett Street Coal Yard, while the slightly rustier line between it and the goods loop was known locally as 'Mark's Hole'! Note the disused former Great Western Railway goods shed on the extreme left, which was demolished shortly after this picture was taken.